Cricketer-turned-politician Imran Khan on Friday night offered an olive branch to Prime Minister Narendra Modi, saying Pakistanis are ready for friendship as war between two nuclear powers is no solution to any problem. “We want peace. We are ready for friendship if you (Modi) are willing. I offer you peace as war is no solution to problems,” Imran said while addressing a big rally in Lahore. “When I met Modi in India I told him that a small group of people may try to derail peace process between India and Pakistan. But When Uri incident took place, India without investigation blamed Pakistan and Modi started hurling threats at Pakistan,” the Pakistan Tahreek-i-Insaf chief said. Imran called on Modi not to talk about stopping water and surgical strikes, saying Pakistan is united and standing behind its army against any aggression. Addressing Modi, Imran said every Pakistani is not coward like Nawaz Sharif. “Nawaz Sharif has great love for money. In United Nations General Assembly Sharif reluctantly made pro-Kashmiri speech. Modi said Nawaz Sharif had not wanted to make that speech but he did so on the pressure of army chief Gen Raheel Sharif,” Imran said. 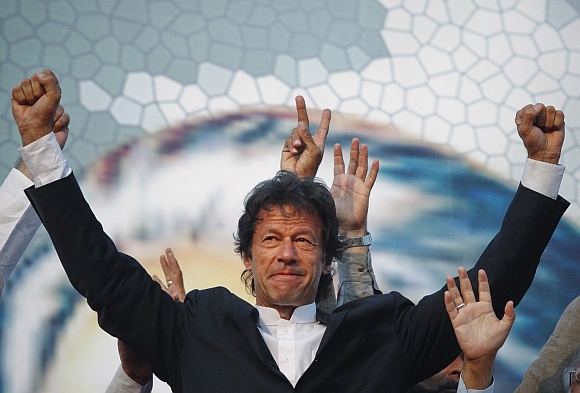 Imran warned that India would bear more loss and stated that Modi’s dream of ‘shining India’ might never be fulfilled if it chooses war over peace with Pakistan. “We will continue our moral and political support to Kashmiris for their freedom struggle. We will raise our voice even for Hindus and Christians if they are denied their rights,” he said. Taking about Sharif, Imran said he would not allow the Premier to run the government after the month of Muharram if his and his family off-shore holdings are not probed. “The time of Nawaz Sharif is over. He has to go. It is our misfortune that Nawaz Sharif is our prime minister. Make him Britain's premier he will destroy Britain in five years as he destroys institutions first,” he said. Imran said this was his last rally to pressure Sharif to present himself for accountability in his corruption revealed in Panama Papers. “Now after (Islamic month of) Muharram we will block Islamabad and will not allow Nawaz Sharif to run his government. Corruption money has weakened Nawaz Sharif. Sharif has committed four crimes -- corruptions, conceal assets, tax evasion and money laundering. He should be made accountable for looting Pakistan and transferring huge money abroad,” Imran said. Imran in 2014 had held a four-month sit-in in Islamabad against 2013 general election rigging.